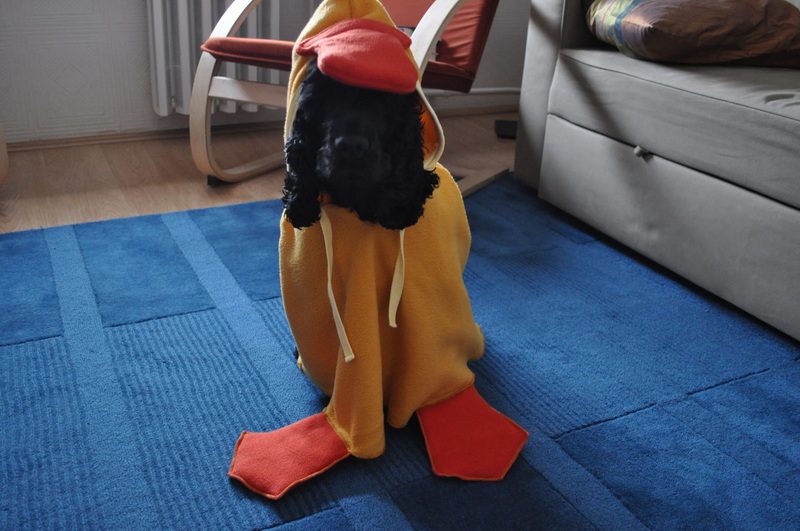 You have to believe me when I say it started with this duck costume, which was intended to be for Carnival. Yes a little jokey, perhaps, but no harm in it. But then our carnival costume shopping ended. And then next aisle over there were sales upon sales upon sales of little clothes. So I rummaged around in my head for an excuse and came up with a good one– I needed Barnabás to model for me as I tested out the aperture and shutter speed settings on my new camera. Barnabás with a little outfit on would be perfect for depth of field experiments, I convinced myself. But when I saw the pictures uploading of Barnabás in his office-wear, I knew we had taken it too far. Then I received an email from my mother, and I was sure that when I opened it, she would set me straight about Barnabás’ costumes getting a little out of hand. 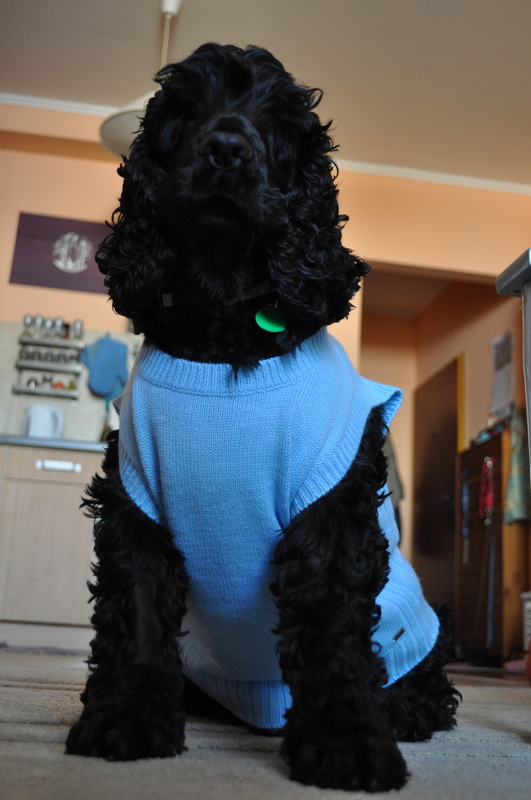 (After all, I had written to her explaining the challenges of his size– boys’ 24 months, though his hips are skinny and his belly occasionally sags after long weekends.) But instead of a well-deserved critique, she told me that her dog, Coco Elaine Jewell, was probably (she wasn’t sure) a 3T. Toddler that is. 3 years old. She does have a thick neck. You have to understand that Barnabás really is a care-free soul, as long as he can always hang out with us. 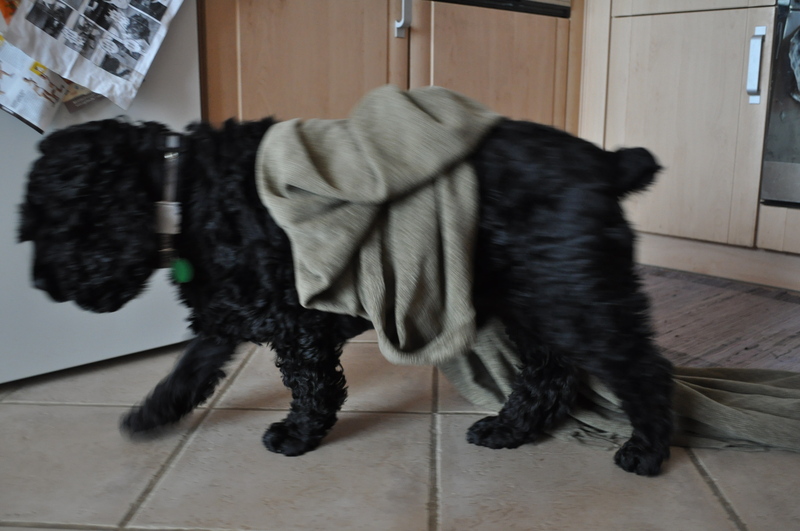 Sometimes when he gets up from the couch, he drags the blanket that was covering him around for hours. He’ll lay down with it somewhere else, then move again, taking it with him. And honestly he would carry around a baked potato on his head if I asked him too, and I gave him a little treat. 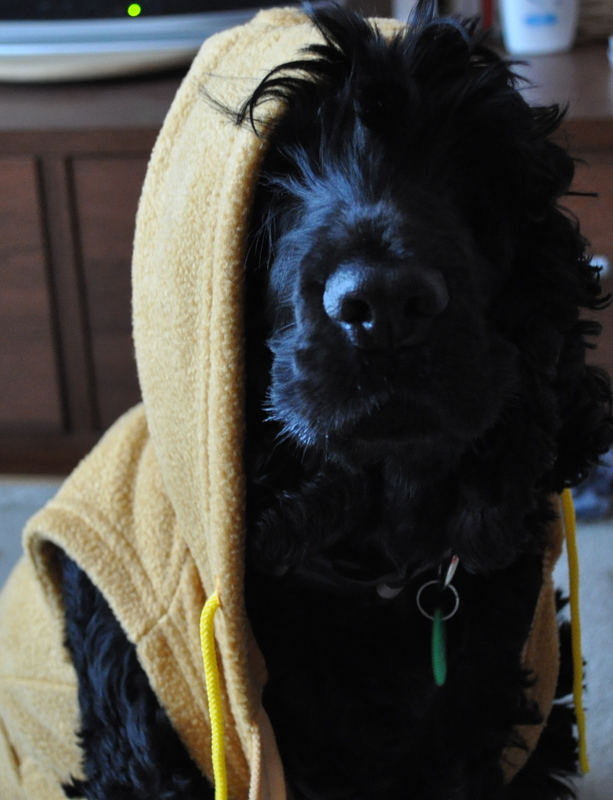 I think he genuinely likes taking pictures now (probably because he knows that all photography sessions end in a salami or bone). And I know I’m not the only one who does these things. Coco Elaine Jewell got a Martha Stewart bed for Christmas. And a pearl necklace. According to the amazing Horizon documentary I watched a few nights ago– Secret Life of the Dog– since they mapped the dog genome and went through half a century of research into dog’s domestication–we now know that dogs are closer to humans in terms of behavior than even chips. Smart dogs can even perform analytical thinking skills, can retrieve objects after being shown pictures of the objects– understand that one things REPRESENTS another thing. This is something that not even human toddlers can do until 2 or 3 years old. Dogs respond to pointing even though they don’t exhibit this behavior in the wild. And scientists in Hungary found that, like humans, dogs look directly into the left eye of humans to gauge emotion (just like humans do). If you are a dog-lover, you honestly need to find that documentary on Youtube and watch it. 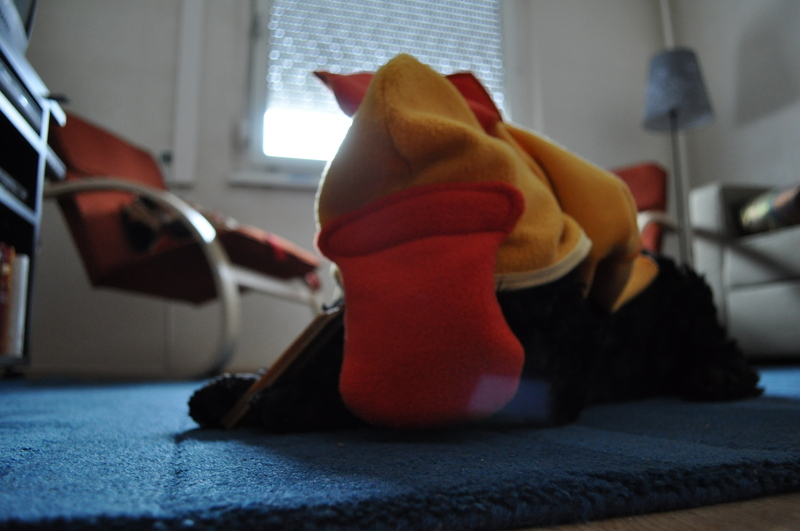 And I’m not saying that Barnabás is some kind of genius for sitting still when he wears a duck costume. Or for falling asleep halfway through our photo shoots. But he is patient. And damn cute. jes, this may be my favorite of your blogs. i love reading about your traveling adventures and the historical triumphs of the hungarian people, but as you know, i like dogs more than most people. barnabas is so friggin’ cute and i just adore how he lets you photograph him. i wish irie were as patient as he!